Stargazing can keep you busy all year long, with more than 88 constellations visible in the sky, from the big bright obvious ones like Orion the Hunter, to the tiny faint hard-to-spot ones like Mensa the Table. Many are best seen during specific seasons of the year. 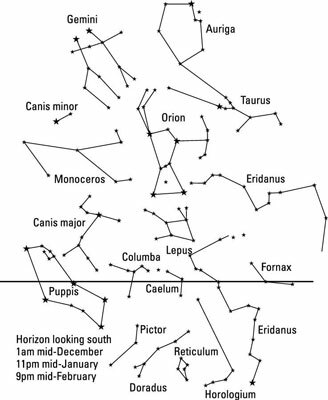 The constellations in the following map are best seen in the months of December, January and February. Northern hemisphere stargazers may only be able to see the constellations at the top of this chart, while southern hemisphere stargazers may only be able to see those at the bottom. The horizon line marked in the figure shows what a stargazer at mid-northern latitudes sees. 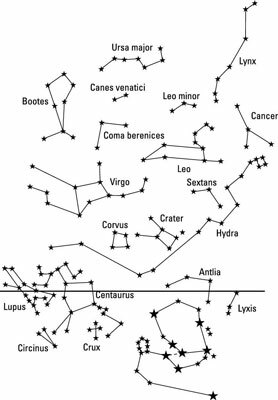 In the months of March, April and May, a parade of animals are on display, including zodiac constellations like Leo the Lion and Cancer the Crab. Northern skies are illuminated by Boötes the Herdsman, marked out by the bright star Arcturus, the fourth brightest in the night sky. In southern skies you see the mighty Centaurus, half man, half horse, whose front foot is α Centauri, also known as Rigel Kentaurus, the closest bright star to the Sun and the third brightest in the night sky. 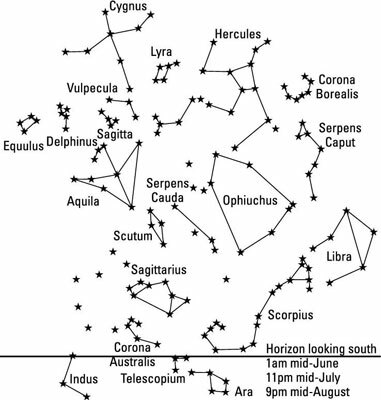 The summer constellations are best seen in the months of June, July and August. 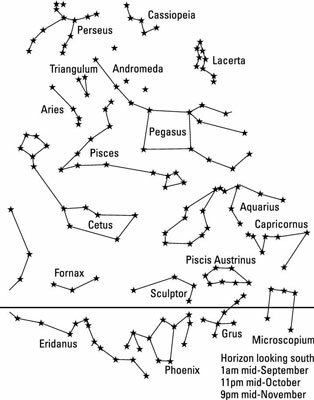 A map of these constellations is shown in the following chart. The horizon line marked in the figure shows what a stargazer at mid-northern latitudes will see. Northern hemisphere stargazers may only be able to see the constellations at the top of this chart, while southern hemisphere stargazers may only be able to see those at the bottom. The stars of Andromeda, Perseus and Pegasus dominate the skies during September, October and November for most stargazers, except those south of around 30 degrees south. Andromeda features one of the best faint fuzzies in the sky, the Andromeda Galaxy. Northern hemisphere stargazers may only be able to see the constellations at the top of this chart, while southern hemisphere stargazers may only be able to see those at the bottom. The horizon line marked in the figure shows what a stargazer at mid-northern latitudes will see.